7 + 8 = Required Please enter the correct value. Buying shares in gold ETFs is like buying stocks. A fund manager will hold physical gold in vaults and issue shares against the value of their holdings. But after gold prices peaked in August 2011, the yellow metal has fallen 38% over the last three and a half years. And this long downtrend in gold has provided a unique opportunity to invest in gold at a discount. To do this, the best gold "stocks" to buy aren't exactly stocks. They're closed-end gold funds – as opposed to the typical gold ETFs or open-end funds. A fund trades at a discount when shares fall below the net asset value of a fund (net assets divided by shares outstanding). When they are above NAV, they trade at a premium. This doesn't happen with open-end funds because those funds will continue to issue shares as long as the demand is there. Share price will reflect NAV. With gold ETFs, there are opportunities to buy at a discount. But typically, ETFs don't provide the opportunity to get that deep discount. ETFs trade with market makers that facilitate a tight bid/ask spread around an ETF's NAV. Closed-end funds are different. Fund managers don't issue new shares as more investors jump in. So as the price of the underlying asset falls with no change to its outstanding shares, the share price can fall below the net asset value. And you are essentially buying gold at a discount. 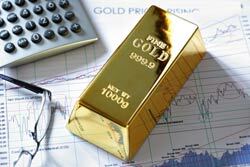 We asked Money Morning Global Resource Specialist Peter Krauth to give investors his insight on which gold stocks to buy now. He picked two closed-end funds that provide the best alternative way to invest in gold. The Central Gold Trust is a thinly traded gold fund. About 84,000 shares are traded daily. It has a market value of $785.5 million, with 98.7% of its holdings invested in unencumbered, allocated, and segregated gold bullion. The remaining 1.3% is made up of cash. The Central Fund of Canada Ltd. (NYSE: CEF), a Toronto-based investment holding company that specializes in passive, long-term precious metal investments, manages the fund. "This is a closed-end fund, so will often trade at either a premium or discount to net asset value," Krauth said. "Right now, investors benefit from a generous 7.8% discount, meaning they can essentially buy gold at a discount."